Tälja is replica of a thousand year old boat, Viksbåten, found in Roslagen, a coastal area north of Stockholm. Viksbåten is unique. The original is the best preserved vessel yet found from the Viking time or early Middle ages. This boat can tell us how boats and ships were built in Roslagen in that period. Viksbåten was found in 1898 on a farm in a place called Vik, Söderbykarl. It was left or sunk near the shore of Söderbykarl. The farmer Törnquist was digging a trench in his field. He dug right through the remains of the boat. Not until a year later, another farmer, Erik Ersson, who was very interested in history, gathered all the pieces and took them to a barn and stored them. Thirty years later, these boat parts were shown in the local museum at Erikskulle, in Söderbykarl north of Norrtälje. They still could not judge the age, so it was stored again. In 1985, archeologist, Gunilla Larsson, rediscovered the boat and now it was possible to date the boat to the mid 11th century. During the period 1993-94 boatbuilder Axel Lindberg restored the vessel as an exhibit at Sjöhistoriska museet (Maritime Museum) in Stockholm. About 75% of the original was able to be used. Things like oars, mast, sails etc., were missing. Access to the reconstructed original made it a lot easier to build a nearly exact copy. This reconstruction has given a great insight into the methods and tools used thousend years ago. As a result, copies of original tools were made to carry out the project. Oak was used and cut from logs using some of these Tools for example adzes and other axes for making planks which are 15-20 mm thick and cut along the grain. The hull made from these oak planks, is of klinker style and held together by juniper pegs. Several hundred nails and rivets which have been hand forged and tar burnt were used. To get the hull to the correct shape, a jig was first constructed. Launching and naming took place in Spring 1998 by Margareta Lindskog, Erik Erssons great, great, great grandchild, 100 years after the digging of the trench by Törnqvist. Tälja is a light, strong, flexible vessel unlike it’s cousins from the west coast of Scandinavia. She is of a type that can be dragged over land and low water areas. 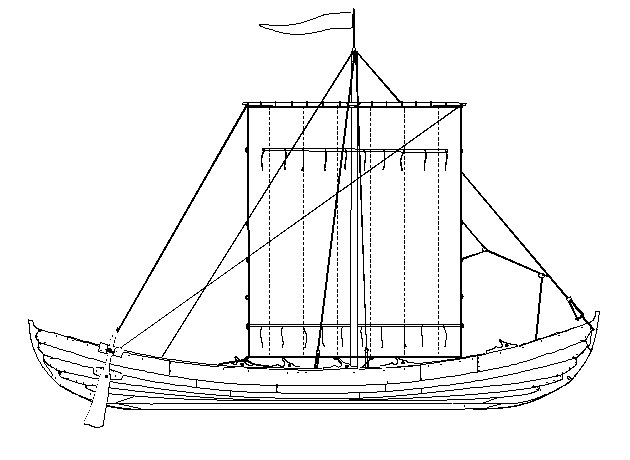 Tälja, with her mast, rigging and sails, shows good sailing characteristics both on and off the wind. The role of the Viksbåten Association is to evaluate the abilities of the boat and in doing so, to discover the uses of the original. Today the association’s members can look back on many great projects and voyages in which Tälja has been involved, for example in Newfoundland, Canada and a voyage to Sankt Petersburg, Russia. The Association also does trips to teach boat handling and sailing and of course enj oy a most unique sailing experience.